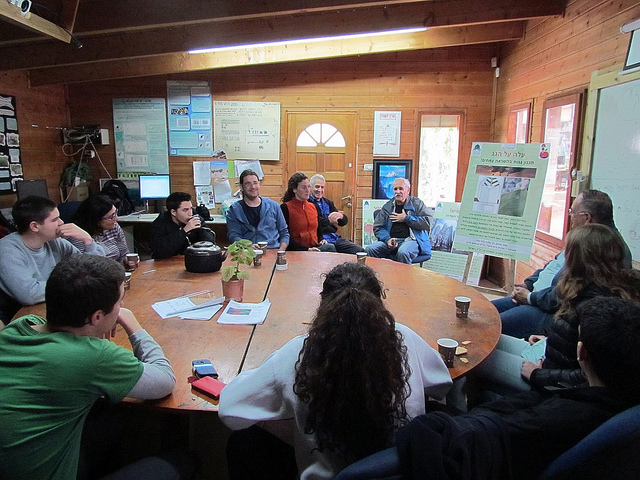 ISRAEL21c takes a look at what’s bubbling inside the pools filled with water and plants at an unusual ecological project on an Israeli kibbutz. 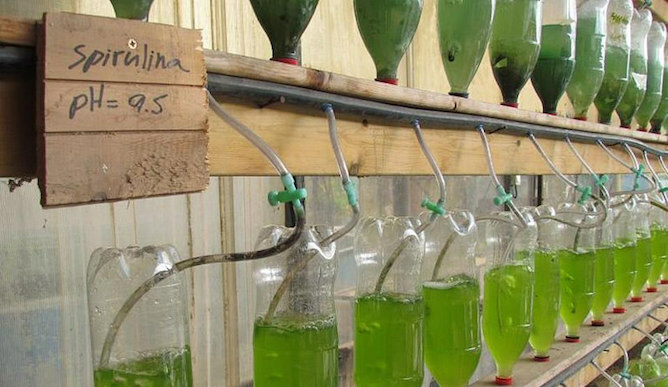 Spirulina-growing experiment at the Greenhouse. A Hollywood set, no matter how creative, could never top the real life “Mad” science happening at the Greenhouse in Ein Shemer. A space envisioned by an Israeli artist and developed within the freedom of a kibbutz, the Greenhouse is not only a living laboratory, it’s a home, hangout and space where unlikely people meet ecology. I recently caught up with Noam Geva, program coordinator, and the son of Avital Geva, a counter-culture artist who broke with the establishment to start the Greenhouse idea in the 70s. Last year the project came full circle and Geva Senior was awarded a Lifetime Achievement Award by the Ministry of Culture and Sport. But the Gevas, I see, are modest people and they wouldn’t want me to dwell on this fact. They want to give credit to what’s bubbling inside the pools filled with water and plants. Making chips? Not making out? The wholesomeness of the people and scenery extends through multiple wings, additions of greenhouses that link together –– some parts as hot as an inferno, others cool like a rainforest in spring. There is always a pot of Turkish coffee brewing. Where do you rest your eyes at the Greenhouse? Is it on the vertical gardens built by teenagers now dripping into pools of water flowers? Is it the massive rain machine meant to study how algae blooms are carried by rain to sea, if at all this is the case? Is it on the top secret fish breeding project, or the salinity experiments on plants being carried out by both Jewish and Arab Israeli students? How about the hundred or so bubbling soda bottles filled with algae—those in the bright light an emerald green, those in the shade with a touch of green. “We create the conditions here for students to invent and feel like they are saving the world,” says Noam Geva while giving ISRAEL21c a personal tour. Lots has changed since we covered the Greenhouse in 2007. Now there are about 5000 Birthright students from the United States and Canada that come for tours of the Greenhouse every year. And a steady stream of about 450 young inventors that start and tend to science experiments. Some of them on their own, some with guidance. Biomimicry workshop at the Greenhouse. A new aeroponics unit built by an MIT student, and collaboration with the American university, is proudly displayed by Geva. Over in a central area of the Greenhouse where about four buildings come together is a display of science projects connected to biomimcricry – from biology to design. The students were charged with taking one idea from the Greenhouse, it could have been any plant growing there, and they were to build a science project around it. One group of three focused on the Canna indica, a big leafy plant from South America. They proposed its water-repellent leaves would be an ideal roofing material for people in rural settings. But along the way of their studies discovered something new: the leaves lowered the pH of any water that ran across them. A solution for acid rain? It used to be that new ideas for high-tech came out of the high schools. Now research at high schools is far behind the industry. Geva wants to reverse the trend. The science here isn’t done in the dark or in the air, Geva explains. Top researchers from the Weizmann Institute of Science, or the Technion and other academic institutes come to lecture and guide the students. Other teachers are R&D managers of companies, consultants, and high-tech leaders looking to impart their knowledge into basic science and environment best practices. The students come in all shapes and sizes, but usually spend one day a week at the Greenhouse conducting experiments. There are groups of kids like Ethiopian kids who are challenged with the regular framework of studies in school, all the way to give students who want to carry out some dream experiments. The interaction of Jews and Muslims is a regular occurrence, Noam explains. And the students don’t only carry out experiments: when the chance arises they also build structures and learn how to weld. No doubt they also learn how to drink bitter Turkish coffee like “men”. But indeed it’s a magical place that fills the senses with curiosity and a need to get lost. Like you’ve found the entrance in the back of your closet to Narnia and it explodes into a jungle that you can touch. But this Narnia is in the real world. And it’s in Israel. Can playing with junk lead to creativity and innovation?